Yesterday I had to get to the Post Office early and then in to town to pick up a new flash gun. On my way home I stopped off at a dragonfly breeding pond to see what was what before getting back to listen to the test match. The sun shone and it was warm as I left the car park. As soon as I found the pond a load of damsels flew up and away across the grass and flowers bordering the water. 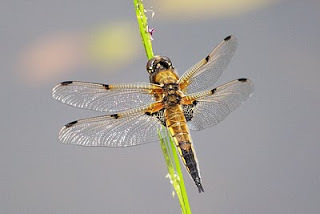 It was the dragonflies I wanted to have a look at. My first glimpse of one was like that of the damsels - flying away, but they were to be seen. My first photos were of far off insects amongst the clutter of plant stems. I wandered round for a while, checking my watch so I wouldn't miss the first overs of the day, but didn't see much else. 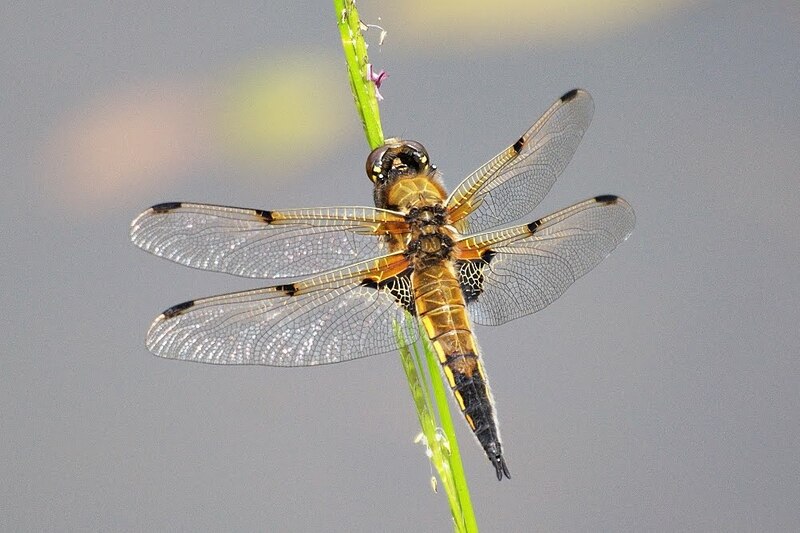 On the way out a four spotted chaser landed on a rush stem overhanging the water and let me get reasonably close. This made for a nice soft background to set off the fine wing detail. A few wobbly shots were taken using natural light, followed by one sharp shot, then I tried the in-camera flash - not having taken any batteries for the new gun... This turned out okay but a bit overdone with the flash despite adjusting the output. During the lunch break at Old Trafford, having read the manual for the flash, I nipped round the back of my garage where bees were buzzing round some spiky plant. 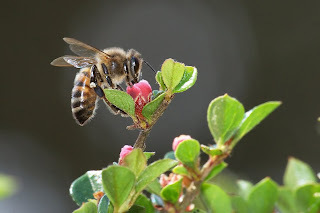 The honey bees were more predictable, working in a logical way along the flowers. The small bumble bees that I really wanted to photograph were far more erratic. They would land on a flower then buzz off to another flower, but one that could be anywhere rather than a few inches away. Stupid creatures! As expected, when I went in search of the warblers I had seen yesterday in the evening they were notable for their calls from unseen perches. Rain is on its way over the next few days. I'm hoping it's accompanied by rod blanks so I can finally start catching up again.